Pac-Man? Yeah I knew him, but I haven’t seen him in years now. Do you know why we called him Pac-Man? 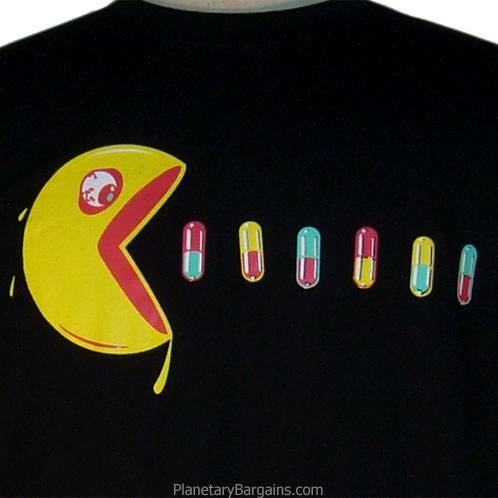 He used to eat so many pills, packs of them each day, and one day we took the pills away, so Pac got really angry and started chasing us around the house shouting. “Give me the Pack Man! Give me the Pack man!”, so Pac-Man became his nickname. He was a real “Mental Warrior”, each day he fought an epic battle inside his head against hallucinated ghosts, which he thought were trying to eat him. He used to run all over the house, trying to get away from his ghosts, and then all of a sudden he would reach in his pocket, and bring out what he called his “Power Pellet”, eat it, and turn around all powerful like, to chase down his ghosts for a while. Pac didn’t just do this now and then, this was his lifestyle. Other than the pills, the guy hardly ate, just a bit of fruit, or maybe a pretzel now and then. I haven’t seen Pac for years now, last I saw him he ran into a tunnel screaming “Ghosts!”, and then he just sort of vanished.